For nearly 1,000 years the site of Suffolk's Cathedral has been one of worship and pilgrimage. The death of Edmund, King of the East Angles, in 869 led to the building of a Norman abbey to house the remains of the martyred monarch. Several churches were built within the precincts of the abbey. The nave of today's church is the successor of one of those churches; it was started in 1503. Though little remains of the Benedictine Abbey, St James' Church has continued to grow over the centuries with alterations in the 18th and 19th centuries. 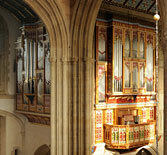 In 1914 St James' became the Cathedral church of the Diocese of Saint Edmundsbury and Ipswich. After the Second World War, since the late 1950s, the completion and enlargement of St Edmundsbury Cathedral has been the inspiration of Stephen Dykes Bower (1903-94) who was architect here between 1943 and 1988. He sought to blend seamlessly early sixteenth work with modern gothic design in a relatively plain style but supported with richly decorated ironwork, joinery and furnishings. The last 40 years has seen several additions as well as the building of the Cathedral Centre, which houses the Song School for the Cathedral Choir, the Pilgrims’ Kitchen and meeting rooms. 2005 saw the Cathedral completed with the Millennium Project adding a new tower, chapels and cloisters. The Cathedral serves not only as the Parish Church of St James but also as the Mother Church of Suffolk and as such prayer is offered daily services for the local community and the world at large. It is a busy place with many staff involved in the daily running of its work and ministry. At the same time it is there for anyone to use for quiet reflection or private prayer. Completed in 2005, the new Cathedral Tower has changed the skyline of Bury St Edmunds. Built of Barnack limestone, lime mortar flint and bricks, it was funded by a legacy from the architect Stephen Dykes Bower and the Millennium Commission. The Patron of the Tower project, HRH The Prince of Wales, called the tower a "spiritual beacon for the new Millennium". Having completed the new tower, there had long been a desire to 'crown' it with a magnificent vaulted ceiling. In 2009 local Suffolk firm Taylor Made Joinery created a vault of European oak, which was then painted and gilded by Hare and Humphreys. The vaulted ceiling won the RIBA heritage East award 'Spirit of Ingenuity' 2010. Stephen Dykes Bower rehoused the organ in the new organ loft in the 1960s. The instrument itself had begun to get tired and in 2010 it was completely refurbished by Harrison and Harrison. At the same time, a generous donation made it possible to add two magnificent painted and gilded cases to complete Dykes Bower's original vision. Martha's Vineyard is named after a young girl, daughter of Bartholomew Gosnold, the explorer and founder of Jamestown, Virginia in 1607. Martha was baptised in St James church (now the Cathedral) in 1597. 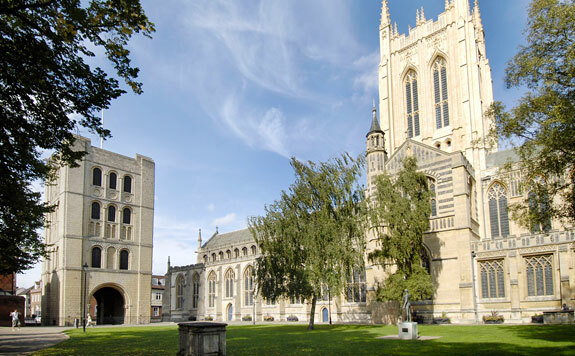 The Cathedral and the town of Bury St Edmunds have a long and friendly relationship with the people of America. 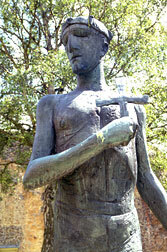 The Cathedral is proud of its links to St Edmund, although he was never buried in the Cathedral. Edmund's shrine was in the Abbey 'next door'. However there are numerous references to Edmund, in stained glass, statues, paintings and needlework. The Cathedral is open daily. There is no charge for admission, but donations are appreciated. Regular Public Guided Tours (11.00am daily except Sundays) run from Easter Monday until the end of September. If you wish to bring a group for a tour, please contact the Visitors' Officer on 01284 748726 or email pr.manager@stedscathedral.org. Tours cost £4 per person. A range of options with refreshments are available. The Discovery Centre, the Diocesan and Cathedral Centre for children and all those who work with them, is available for children and young people. Activities can be linked to the National Curriculum and include topics such as 'The Edmund Story', 'The Christian Journey' and 'History in the Making'. Special family activity days are held during the school holidays. Details from the Education Officer on 01284 748731. Wheelchair users can make a full tour of the Cathedral (temporary ramp available in Chancel), Cathedral Centre fully accessible. Toilets in the Cathedral Centre - including one equipped for disabled visitors. There is no parking available at the Cathedral but there are plenty of inexpensive car parks nearby. No coach parking at the Cathedral but coach set off point on Angel Hill. Coach parking at Rougham Hill. The modern licensed Pilgrims’ Kitchen offers morning coffee/afternoon tea and a range of hot and cold lunches. The Pilgrims’ Kitchen can also cater for groups and special functions. Please contact the Pilgrims’ Kitchen on 01284 748738. The shop offers a wide range of books, gifts, CDs and greetings cards.